The Touch the Earth II Preserve in Brown County is a familiar sight along State Road 46 in between Bloomington and Nashville, just east of Jackson Creek Road. The two old livestock sheds in the front field are remnants from earlier days, when the property was part of the Way farms. Now reverting to nature, this field is part of the rural scenery for which Brown County is famous. 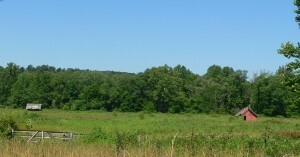 Donated anonymously to Sycamore Land Trust in 2006, the 123-acre preserve was the largest gift of land Sycamore had received up to that time. Over a mile of the North Fork Salt Creek flows through the preserve on its way to Lake Monroe not far downstream. Yellowwood State Forest is just on the other side of Jackson Creek Road. The preserve does not have trail or public parking, but the scenic view it provides can be enjoyed every time you drive past.